Today we’re looking at the ‘Dark Brew’ version of this bundled line, for those of you who like a little afternoon cold brew or just down a pot by yourself every morning. Up top, a toothy, slightly sweetened Mexican San Andres wrapper leaf provides the chocolate and black pepper notes to complement the coffee core, with the Dominican binder and long-filler keeping things sultry and smooth. Load up on a couple bundles – I’m willing to bet this one becomes a regular in your rotation. Very nice smoke for the price. Subtle coffee and chocolate notes. Not overly sweet, which makes for a feeling of higher quality. So far all have burned nicely. Smoked all down to the nub. I would say starts medium full and ends mild to medium. Band is high quality as well. Will definitely keep a plentiful supply. Excellent for the price. Flavor and taste are nice. I wasn't expecting a Swisher sweet. Nice smoke. Has a smooth flavor and nice even burn. Not too strong. A nice addition to any humidor, especially if you're into herbals and/or flavors. I usually don't smoke flavored cigars, but like Maduro, not bad at all! I enjoyed after trying for the first time. My on problem with this cigar is that some are rolled really lose and burn very quick. Has a great aroma, good every day cigar. I purchased these sticks to try them out and they were okay. Decent construction and aroma but the taste reminded me of some bitter dark chocolate that a coffee infusion. Very blandish aftertaste. If you are on a tight budget, and want a somewhat infused cigar, this would do fine. Just ain't feeling this stick. Not a memorable smoke but okay for the price. I thought they were great. iwas so sadden when i went to reorder theem they were all gone. The word Backorder was there. Decent flavor, but most burn badly. One wrapper just fell off! Full bodied easy draw and beautiful coffee and chocolate notes! Must have in stock in your humidor! Got these on sale. Was pleasantly surprised by the flavor. Good everyday smoke. Will definitely buy them again. Nice, tasty cigar! Until the last quarter then it became just a gas station cigar. Great smoke when you want a cigar but don't have 2 hours. nice everyday cigar. really enjoy them. smooth smoke, easy draw, great coffee/chocolate taste. an extremely enjoyable cigar. definitely five stars. Hate to say it but it’s NICE. Hope that it doesn’t go on the back ordered list. 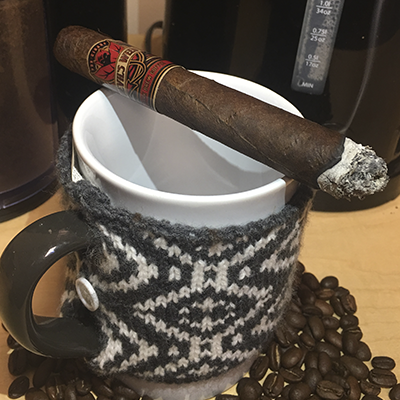 This is my daily smoke, so if you like flavored cigars like i do and like the coffee ones, then this your smoke!, this is a slightly sweet big bold cup of black coffee! I havent tried the other wrapper yet but i'm sure its great also, but i'm keeping this one and ya can't beat it for the price!!! Didn't realize this was an infused cigar. Guess I didn't read it right. However, the infusion is so overpowering. Will say the one I did try was well made and smoked well. I love coffee with my cigars, the graphics on the bundle are so much fun, so I had to try a bundle. First of al, this is my first "coffee flavored" cigar, but I really doubt these are coffee bean infused. Half way through my bundle of these cigars, this is my impression: 1) sweet smelling smoke...almost like incense. 2) Draw and construction is smooth and easy. 3) The taste is also sweet, but i don't get an impression of coffee from it. Conclusion: similar to other artificially flavored cigars. But it's not bad, especially for the price. Good cigar for the price burns even had a few bad ones. Got alot of chocolate take very tastey. Keep separate from you none flavor smokes. Everyone enjoyed these! Great buy. Everyone enjoyed these! Great buy. Easy smoke. I was really impresses with these cigars, they have a nice smell and subtle flavor before lighting. So are I have smoked about 8 of them with no issues, smooth and even draw to the end. They are a nice change from my other cigars and would buy them again. Nice flavor, burns decently, not very tightly rolled but not overly loose either. Good smoke for the price. I was not aware that these are flavored tipped cigars, which I normally do not like. That being said, the flavor does not last for the entire smoke and the coffee infusion is actually really good. Really smooth smoke. A great after dinner cigar. Would not have known about these w/o CI's special emails and am very glad they sent it out pertaining to this smoke. Opening the package was a pleasant surprise with a rich aroma with a slight sweetness. Lighting my first one had me sold. It's smooth, smokes well and even and the taste is good along the entire length. Drew Estate watch out for this one. As said on the staff review, it's a loose rolled cigar and is a bit squishy but will buy again. Just received these and what a great cafe cigar. The wrapper smells of rich chocolate and the taste is coffee, chocolate and spices. This is great in the morning and with coffee. The only negitive is the construction is not the best. Iv had 2 now and both fall apart at the head about the last 3rd. Better than I expected. Good draw, even burn decent flavor. Not Java, but pretty good. Bought them for a friend since he likes coffee and he said they were spectacular. Also great price for as many as you get!